Although designed for use with patients with TBI, the HiMAT can be used for a number of other neurological and musculoskeletal conditions that result in vestibular and motor deficits. For example, in stroke victims and Parkinson's disease patients - particularly in young adults. 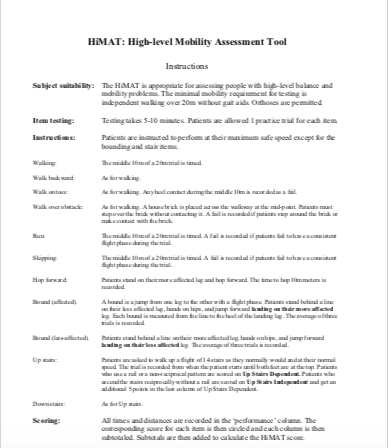 As per the tool instructions, those being assessed using the HiMAT must at least have the ability to walk greater than 20 meters independently without gait aids and with or without orthoses. 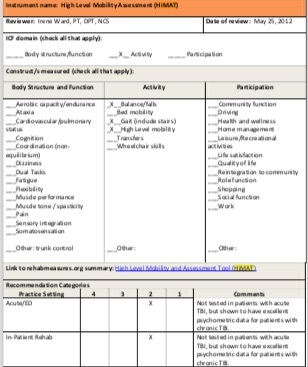 In January 2013, the Traumatic Brain Injury Evidence Database to Guide Effectiveness (TBIEDGE) task force presented a compilation of outcome measure recommendations for clinicians working with TBI patients. 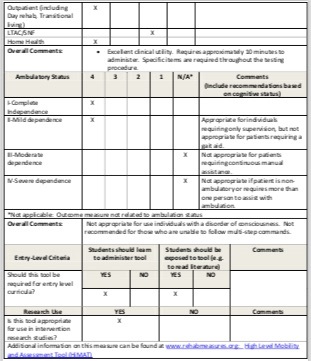 Below is a table showing their final recommendations; the conclusion being that the HiMAT is highly recommended in the outpatient setting as a standardised outcome measure. ↑ Williams G, Robertson V, Greenwood K, Goldie P & Morris, M. The high-level mobility assessment tool (HiMAT) for traumatic brain injury. 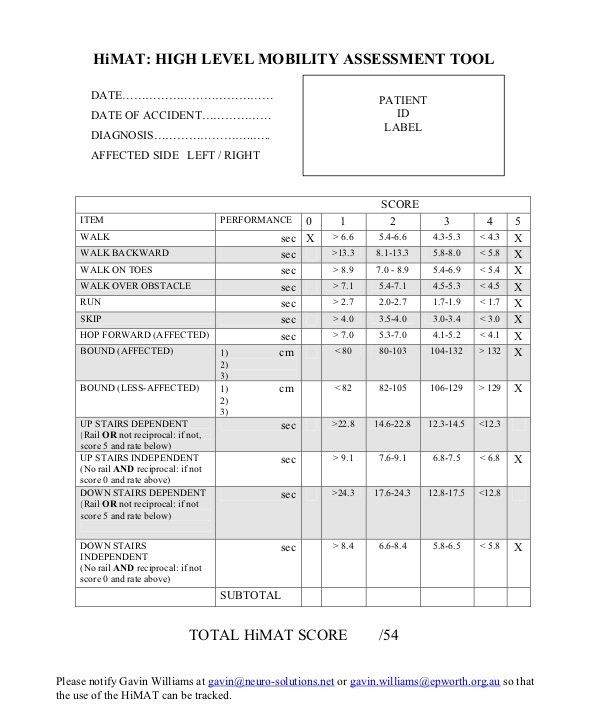 Part 1: Item Generation, Brain Injury, 2005;19(11): 925-932.https://www.tandfonline.com/doi/abs/10.1080/02699050500058687 (accessed 10/06/18).